IPOB family and it's leadership worldwide do not wish to join issues with Lai Mohammed or those who may desire to indulge in the laughable fantasy that IPOB has been weakened as a result of the successful boycott of the fraudulent Anambra elections. Lai Mohammed's comments should be viewed as a cleverly contrived diversionary tactics to deflect attention away from the devastating impact of the boycott on the psyche of the corrupt ruling class in Nigeria. We are therefore inclined to ask all right thinking people to disregard this latest outburst from Lai Mohammed or better regard it as one of those his numerous ill thought out, ill conceived utterances. By now the public must be well accustomed to these wild proclamations that bears no resemblance to reality. They said the same thing about ending the recession but as we all know, the ravaging impact of this economic recession is still being felt by ordinary people till today. Over the years many opinionated commentators have relentlessly harped on the fact that Biafra was dead and buried. Ex-president Olusegun Obasanjo popularised this myth when he told journalists last year during an interview that Biafra was dead. 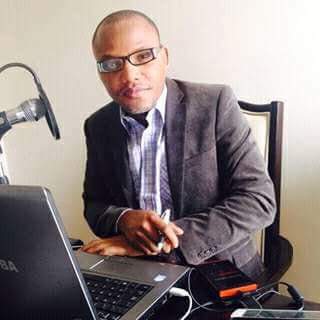 But today, the activities of IPOB, ably led by Mazi Nnamdi Kanu, has not only confirmed that Biafra is alive, it has proven that Biafra is the only issue capable of determining when Nigeria comes to an end not the other way round. Admittedly, not many people understand the inner workings or the strategies IPOB deploy periodically to accomplish its stated objectives, so wild and idle speculations will be thrown about by enemies of Biafra in the hope of derailing our movement. Again we are not moved nor disturbed by any statement coming from Lai Mohammed's Ministry of Information because having spent so much money to ensure a complete media blackout of all IPOB related news stories, our impact continues to resonate and dominate political space in Nigeria. As of today, IPOB remains the largest political movement on earth and we didn't get to this position of preeminence by allowing ourselves to be easily distracted by blatant lies that cannot stand up to scrutiny. Our focus remains the upcoming Biafrexit referendum in the middle of next year, where anticipated voter participation, especially in Anambra, will be nearly 100%. Nigerian government and her agents can say or do whatever they like, we IPOB can guarantee the people that we are on course to peacefully remove Biafra from the Luggardian contraption Nigeria. It is on record that IPOB is firmly entrenched in more than 100 countries around the world and deeply rooted in the subconscious of a people determined to sacrifice whatever it takes for their freedom. To kill IPOB will mean having to dismantle family meetings all over the world at the same time, which is an impossible task for anyone to accomplish. IPOB has been set up in such a way that it can only grow not diminish. New family meetings are opening up all over the world on a weekly basis, so how can such a colossal movement be weakened by mere utterance. It is very unfortunate that some Nigerians, who form the primary audience of Lai Mohammed's propaganda machinery, would allow themselves to be deceived by the cheap lie that IPOB have lost the confidence of the people. The same people that were meant to have lost confidence in IPOB obeyed the command of our leader to boycott Anambra elections which they did. Not even the vastly inflated INEC voters figures concealed the fact that IPOB succeeded in accomplishing their desired objectives of demonstrating that Anambra people want to be free from Nigeria. Despite illegally tagging IPOB a terrorist group, numerous unlawful detentions, compromised judiciary, unlawful arrests and sustained campaign of calumny against IPOB, the people boycotted Anambra elections. What it proves is that IPOB is in charge because less than one percent, 0.45% to be precise, of registered voters actually participated in Anambra State elections.